There was a time, not so long ago, when the iPhone was a byword for exclusivity. Carriers fought for the right to offer it and queues formed outside the small number of shops which shone with its presence. Now you can buy the thing in Tesco. The UK’s largest supermarket, which pockets something like one of every seven pounds spent in Britain, will soon be making the latest versions of Apple’s iconic handset available on its MVNO, Tesco Mobile. No doubt Apple is pleased that the phone will be available to so many people, but the Informer can’t help but feel that there will be some reservations at the firm’s Cupertino headquarters about its brand being tossed about among the great, unwashed masses. To balance out this social descent, a new version of the iPhone has been created, by a UK luxury goods firm called Goldstriker. This phone, built for an anonymous Australian gold magnate, cost $3.2m. Yup, three point two million dollars – for a phone. The diamond set as the home button on this grotesque creation is 7.1 carats. In total there are 68 carats of diamonds on the front of the handset. Truly wealth and taste do not always go hand in hand. No wonder the customer wants to stay anonymous, he’s probably acutely embarrassed. There are no plans for this phone to be made available at Tesco. Yet. O2, which plays host to Tesco Mobile and was the first UK carrier to offer the iPhone, announced this week that it is to bulk up its network with the deployment of 1,500 new cell sites starting immediately and continuing throughout next year. The rollout, which will see 200 new sites in London alone, is necessary because of the popularity of data centric handsets like the iPhone and the usage patterns they’ve inspired, said O2’s CTO Derek McManus. By way of illustration, he said, watching a youtube video on a smartphone can be equivalent to sending 500,000 text messages simultaneously. O2 says its 3G network covers more than 84 per cent of the UK population and is 100 per cent HSDPA enabled. And earlier this year O2 and Vodafone announced a pan-European network sharing agreement that in the UK will see both companies focus on joint building of new sites and the consolidation of existing 2G and 3G sites. O2’s competitors Orange and T-Mobile announced earlier this year their intention to merge their UK operations and Orange revealed a similar deal in Switzerland this week. Orange owner France Telecom and Danish incumbent TDC, which operates Swiss carrier Sunrise said they will combine the operations, creating a new fixed and mobile player. Figures from Informa Telecoms & Media for the end of Q3 this year show that the two carriers combined mobile customer base was 3.41 million, 38 per cent of the market but some way behind incumbent Swisscom, which had 5.54 million customers at the end of September. The new player would also have 1.1 million fixed and broadband customers. The merger, if completed, would leave just two mobile carriers in the Swiss market. Under the deal, the French incumbent will pay €1.5bn to TDC and will become a 75 per cent shareholder in the combined entity, while TDC will hold the remaining 25 per cent. The firms predict synergies of €2.1bn. The move may presage TDC’s eventual departure from Switzerland, as it will have the right to sell its stake to third parties from the second year or launch an IPO from the third year. Over the border in Austria, there’s been an unusual development in the telecommunications industry this week. Austria’s one of those countries where you can’t make civil servants redundant, where bureaucracy remains very much a job for life. 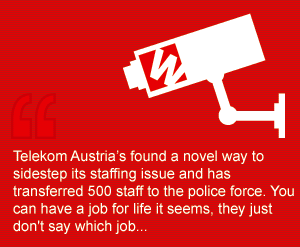 Because Telekom Austria used to be state owned, its staff have civil servant rights, which makes things tricky for TA when it wants to make like the rest of the industry and cut a few heads. TA’s former head man Boris Nemsic, who looks like he’d make quite a good hard- boiled detective himself, oversaw some handy results at his new employer Vimpelcom this week. The firm’s subscriber base grew by 1.7 million during the third quarter, reaching 65.4m. Net profit more than doubled to RUB13.51bn, while the firm also successfully launched its Beeline brand into Vietnam, and struck a deal to enter the Laotian market. The Nortel sell-off came closer to its natural conclusion this week, with Ericsson and Ciena picking over the carcass. Ciena paid $769m for the Canadian firm’s optical networking and carrier Ethernet business on Monday after an auction that ran through last weekend. Ericsson nabbed “certain assets of the Carrier Networks division of Nortel relating to the GSM business in the US and Canada,” the firm said, stumping up just $70m, while the GSM-R business and other bits and pieces outside of North America went to Kapsch, an outfit making its debut in A Week in Wireless this week. For Ericsson the deal represents is a relationship builder with Nortel customers AT&T and T-Mobile. “Along with our recent acquisition of Nortel’s CDMA and LTE assets, the transaction emphasizes Ericsson’s commitment to the North American market and strengthens our position as a leading provider of telecommunications technology and services in the United States and Canada,” said Hans Vestberg, incoming president and CEO of Ericsson. Ericsson may well be the world leader in managed services, but that didn’t sway MEA carrier Zain, which this week outsourced its East African network operations to Nokia Siemens Networks. Under the agreement, NSN will pick up five-year management contract in Kenya, Tanzania and Uganda, with an eye to optimising, modernising and managing 3,000 plus multi-vendor mobile sites catering to nine million customers. Upgrades to energy efficient technologies and off grid power solutions will be a key component of the deal. It’s NSN’s biggest multi-vendor outsourcing deal in the region and is also one of the first such deals of its kind in Africa, the firm said. As part of the agreement, approximately 350 Zain employees will be transferred to NSN. Zain will no doubt hope this will help with the financial drain its African operations are putting on the firm’s coffers. Finally, off to the world of crime, and the news that a UK prison inspector has recommended that phone jamming technology should be used in Brit clinks given the spread of mobiles among inmates. They’re not supposed to have phones, but they are routinely smuggled in by visitors hiding them in their underwear, corrupt prison officers, or even thrown over the walls. They are also, if you believe certain sources, taken by visitors into prisons secreted in what might most politely be described as ‘nature’s pocket’. Last year 7,000 phones were seized from prisoners, although inspectors reckon three times as many are in circulation. They change hands for around £400 a pop. That sounds like a niche MVNO business model if ever there was one. It could be called Cell-cell. Or Con-comm. Or, if there’s a business to be had providing jamming services to prisons, it would have to be called Cell Block. Didn’t we have a prison network called Cellnet? errrm, aren’t cellphone jammers illegal here? A Youtube video is the equivalent of 500,000 simultaneous SMSs? Really? For the sake of the argument, let’s say it takes 5 seconds for an SMS to go through (which it doesn’t). 500,000 text messages at an average of 100 characters each (100 bytes = 700 bits) over 5 seconds means (500000*100*7)/5 bps = 70000000 bps = 66Mbps. 66Mbps is hardly the bitrate of a mobile Youtube video. Even one hundredth (660kbps) of that would be too much.